In Room 143 on the first floor (northeast corridor) is the Royal Charter Museum. 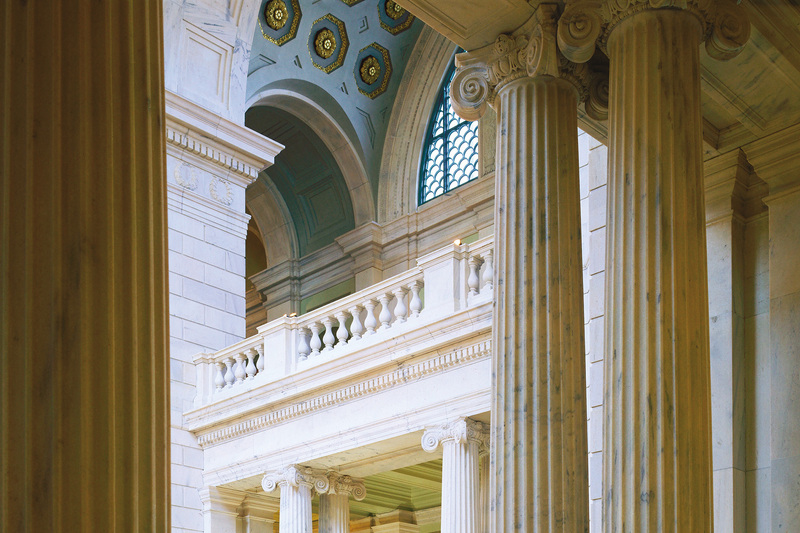 The Charter Museum contains many priceless documents and artifacts that represent Rhode Island's important place in history. The centerpiece of the Museum - the Royal Charter of 1663 granted by King Charles II of England, resides in a custom steel vault. 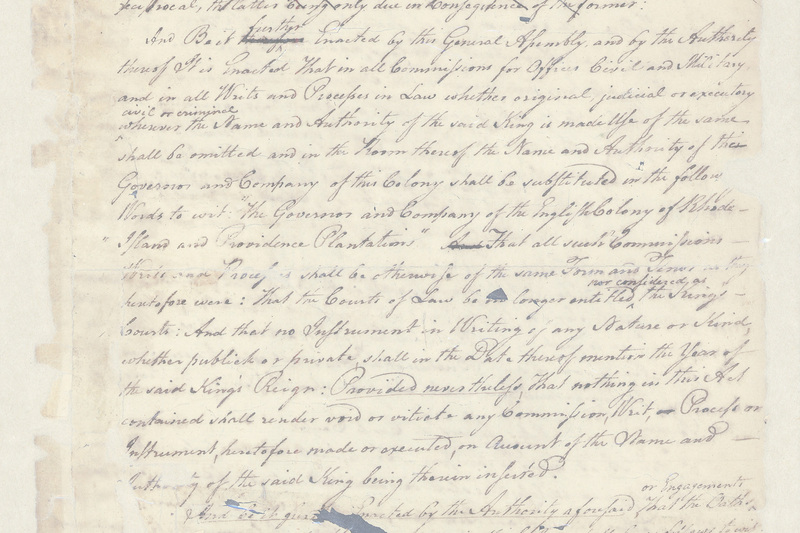 The Charter guaranteed Rhode Island settlers freedom of religion and the freedom to govern their own colony. The Charter is in the care of the Secretary of State, who has been the keeper of records since colonial times. For many years this document had been attached to a piece of cardboard at the back of the vault. But because it is written on parchment (sheep or goat skin), it needs to expand and contract, just like your own skin. In 1996, Conservators removed the Charter from the cardboard, and devised a new storage system. If you look closely, you can see that the Charter is suspended on threads, which now allow the parchment to expand and contract. 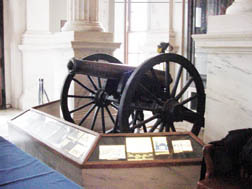 The Gettysburg Gun is found in the foyer of the main public entrance to the State House. Behind it, you will see Civil War flags. The cannon is a special attraction because it has an unusual history. The cannon was last fired during the 1863 Civil War battle at Gettysburg, Pennsylvania. It still has a cannonball wedged in its muzzle. While soldiers of Rhode Island's Battery B, First Light Artillery were loading a shot, the cannon muzzle was hit by a Confederate shell. The dent from the explosion caused the muzzle to become deformed, and when the surviving gunners tried to load a new shot, it became jammed in the muzzle. The cannon was on exhibit in Washington, DC, until 1874, when it was returned to Rhode Island. On August 24, 1962 (almost one hundred years after it became disabled) it was discovered that two and a half pounds of black gunpowder were still in the cannon. Gunpowder becomes more sensitive as it ages and is highly dangerous. 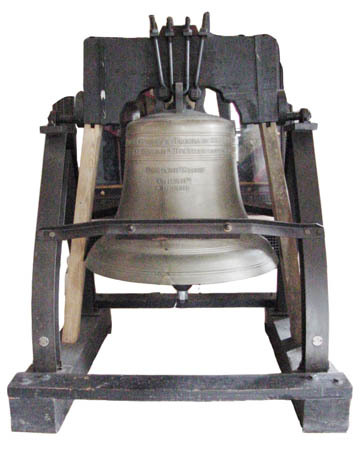 People working at the State House were worried when they learned it could explode. On August 25, 1962 the Rhode Island National Guard removed the cannon from the State House to the National Guard Maintenence shop in Smithfield. Two days later, they successfully removed the black powder, and the cannon was safely returned to the State House. From the outside the Gettysburg Gun still looks exactly as it did at the end of the battle on July 3, 1863. Can you find the drill hole? The rotunda is made of Georgia marble and its interior is decorated with artwork and gold leaf. 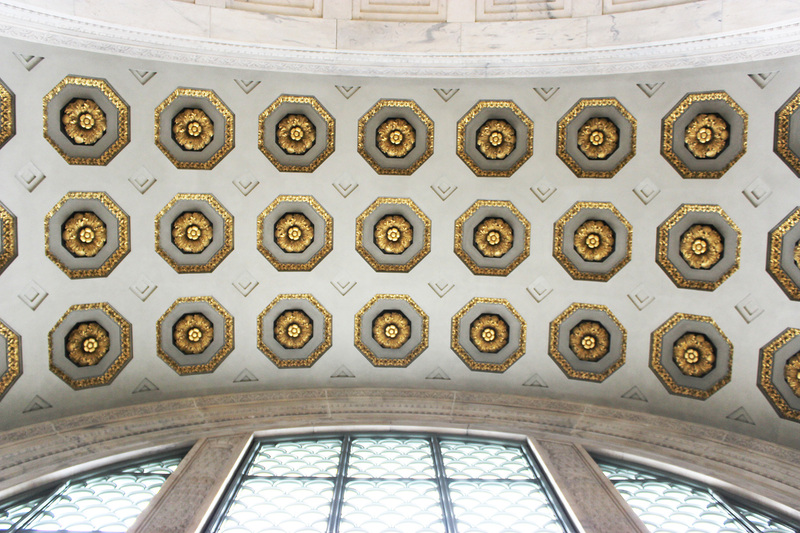 The marble was chosen because of its beautiful white tones which take on a golden glow as it ages. A rotunda is a large round room that often has a domed ceiling. 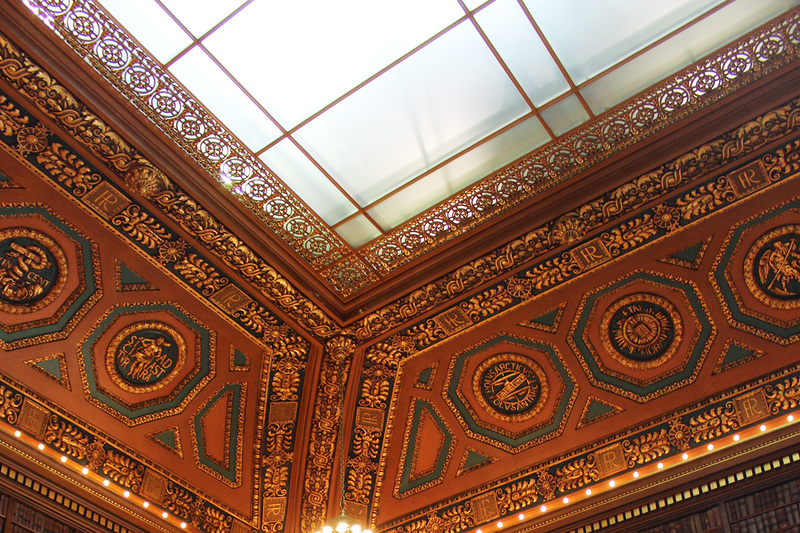 In the middle of our rotunda, on the center of the floor, you will see a beautiful brass replica of the State Seal. It has a golden appearance and is inlaid in the marble floor. It is encircled with a velvet rope to keep it protected. An anchor is depicted in the center of the seal. The anchor is a symbol of hope. Above the anchor is the word "Hope", our state´s motto. 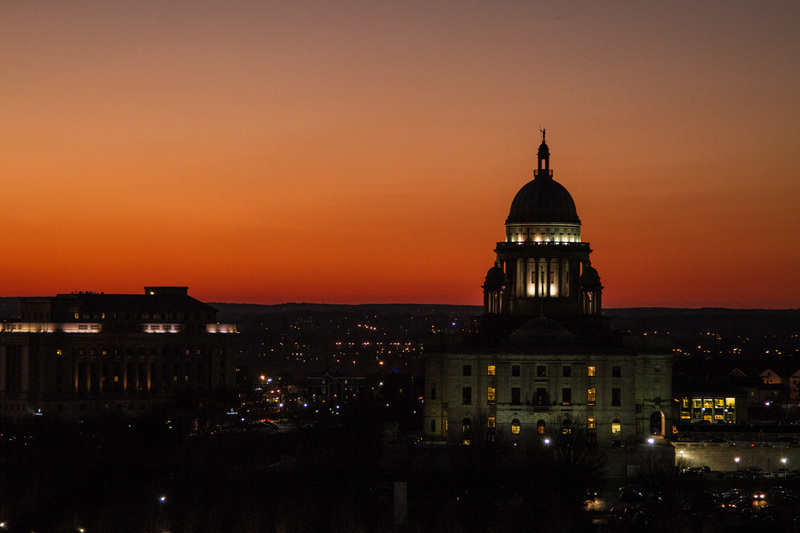 One reason why we use this motto is because the word is found in a famous quote from our state´s founder, Roger Williams, who told the early settlers to have "Hope in the Divine". The anchor also reminds us of water. As you know, Rhode Island's nickname is the "Ocean State", because Rhode Island has over 400 miles of shoreline even though our state is only 48 miles long from north to south and 37 miles wide from east to west. A garland of leaves surrounds the shield which bears the anchor. 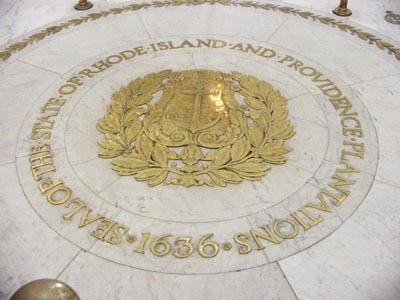 Written around the seal are the words: "Seal of the State of Rhode Island and Providence Plantations 1636." Don't you think it's interesting that ours is the smallest state but has the longest name?